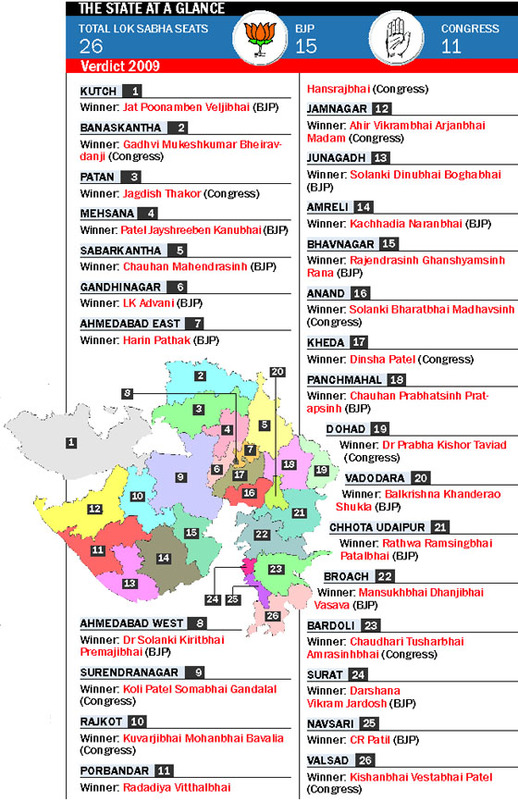 The traditional political equations based on caste and other local factors are unlikely to work in the 2014 Parliamentary elections in Gujarat. The core issue among the voters this time will be 'what's good for Gujarat' - Modi as the Chief Minister or Modi as the Prime Minister. 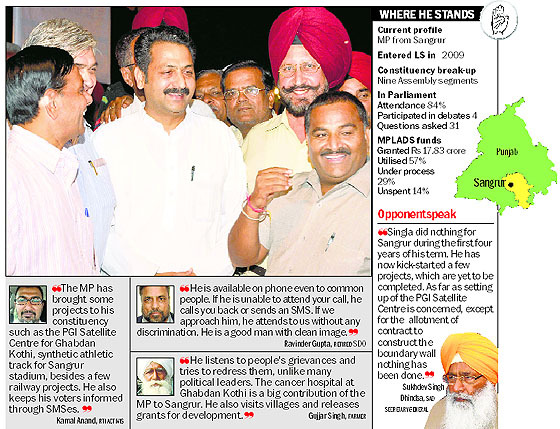 Credited with bringing Central government projects to Sangrur, Congress MP Vijay Inder Singla is lapping up all praise coming his way not only from his party workers, but from rivals as well. Third Front gathers steam, but will it work? Despite being pitched against some of the stalwart leaders of the state Congress, who owed allegiance to her bête noir Chief Minister Bhupinder Singh Hooda, Kumari Selja remained successful in creating an image of a pro-development leader in Ambala. The forthcoming Lok Sabha elections will witness a contest between the ruling Congress and the emerging Bharatiya Janata Party (BJP) in Assam. The regional parties, Asom Gana Parishad (AGP) and the All-India United Minority Democratic Front (AIUDF), have their own set of problems. Having finalised the 26:22 seat-sharing formula, the Congress and the Nationalist Congress Party (NCP) in Maharashtra are likely to swap Raigad and Amravati Lok Sabha seats in the coming general elections. The Congress-led UPA Government was a sinking ship and would not return to power while the Left would face further rejection by the people, West Bengal Chief Minister Mamata Banerjee said today. Noted singer Jaspinder Narula, who won the Filmfare Best Female Playback Award in 1999 for the song "Pyar to hona hi tha", today joined the Aam Aadmi Party (AAP). As the elections are round the corner, people are confused — should they bid Narendra Modi adieu from Gujarat for the sake of the country or should they want him to serve the state. Even if the pace of development is carried forward, people doubt that the state will witness political stability and riot-free Gujarat in the absence of Modi. Some glimpses of the administrative paralysis Gujarat is likely to face in the post-Modi period are already visible. Ever since the December 2012 Assembly elections when Modi was named the BJP's prime ministerial candidate requiring him to make whirlwind tours of all parts of the country, the state administrative machinery has come to a standstill. Not only the policy decisions have to wait for Modi's nod, the administrative officers are confounded over conflicting oral orders issued by three senior ministers, Revenue Minister Anandiben Patel, Finance Minister Nitin Patel and Energy Minister Saurabh Patel, each considering himself to be the "natural successor" of Modi. Realising the dilemma the people in Gujarat are confronted with on supporting the BJP in the Lok Sabha elections, the party think-tank has changed its poll plank in the state. While the "Gujarat model of development" has been made the cardinal issue in other parts of the country, in Modi's home turf "Gujarat pride" will be the election theme for the BJP. 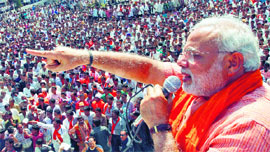 Modi had also made "Gujarat pride" a poll plank in the 2002 and 2007 Assembly elections, but in different connotations. In 2002, he had exploited the "Gujarat pride" to the hilt to lambaste the Congress for "hurting" the sentiments of Gujaratis by raising questions on his government's alleged involvement in the communal riots and in the next elections for calling him "Maut ka saudagar,". With the exception of Morarji Desai, Modi is the first leader from Gujarat knocking at the doors of the prime ministership. But Desai, though hailed from Surat, was never considered the "son of the soil" by the people of the state. Besides, he had made Mumbai his home. The veteran Gandhian had vehemently opposed creation of the separate state of Gujarat bifurcating it from the then Bombay state in 1960. The party is trying to galvanise the sentiment among the people that vote for the BJP will be a vote for the Gujarat's pride. Fortunately for the BJP, the Congress will not be able to touch the "Gujarat pride" issue this time, as it did during the two Assembly elections though with disastrous consequences, without giving a good certificate to Modi, a situation party could ill-afford for survival in a state. The Congress has not been able to come even close to power at any level from the taluka panchayats, municipal corporations and municipalities to the state government in the past 19 years. Its advising people not to allow Modi to go to Delhi would amount to its tacit acknowledgement of his "contribution" to the state. Modi's principal opponent is forced to harp on only the fringe issues, Gujarat's alleged "lopsided development" under Modi, "corruption" in the state administration, "deteriorating" law and order situation and on the plus side "performances" of the Congress-led UPA Government. As of now, none of these issues seems to be cutting ice with the people in the state. Though Gujarat has only 26 seats in the Lok Sabha and is smaller in size than many other states, the BJP's performance on Modi's home turf could have a significant relevance in the country's political situation. Besides, every seat gained would bring the BJP closer to the magic figure of 272 in the Lok Sabha. Every seat lost would that much blur Modi's super leader image creating potential challengers to his leadership within the party. Going by the past records, minus the "Gujarat pride" issue, there is nothing much to choose between the BJP and the Congress, except that the Manmohan Singh government's anti-incumbency factor would be weighing heavily against the Congress this time. In the last decade, contrary to the BJP's sweeping victories in the consecutive three state Assembly elections, the Congress was able to give a close fight to Modi's party in the last two Parliamentary elections in the state. The BJP won 14 seats leaving the remaining 12 to the Congress in the 2004 Lok Sabha elections. In 2009, when the Congress won more seats in most of the states, it shrunk by one in Gujarat to 11 increasing the BJP's tally to 15. The two parties also closely shared the percentage of valid votes polled. In 2004, the BJP vote share was 47.37 per cent and the Congress 43.86 per cent with the next highest vote share going to the Bahujan Samaj Party at a meagre 1.48 per cent and the Nationalist Congress Party 1.16 per cent. The other parties, including the CPM, Samajwadi Party and JD(U) not even crossing the threshold of 1 per cent votes. In 2009, the vote share of both the principal rivals declined marginally. The BJP polled 46.50 per cent votes and the Congress 43.40 per cent with no significant change in the fortunes of the other parties in the fray. The marginal decline in the vote share of the two parties was despite the marginal increase in the total poll percentage, from 45.18 per cent in 2004 to 47.89 per cent in 2009. Poll percentage:In 2009, the Congress won 11 seats in Gujarat and the BJP 15. The BJP polled 46.50 per cent votes and the Congress 43.40 per cent with no significant change in the fortunes of the other parties in the fray. The marginal decline in the vote share of the two parties was despite the marginal increase in the total poll percentage. One of the major projects he has brought to his constituency is the 300-bedded PGI Satellite Centre (popularly known as cancer hospital) at Ghabdan Kothi (near Sangrur). The foundation stone of the Rs 500-crore centre was laid on October 10 last year by Union Health Minister Ghulam Nabi Azad in the presence of Congress vice-president Rahul Gandhi. Besides providing employment opportunities to the local residents, the centre is bound to change the profile of the area. Other projects brought to Sangrur by Singla include Rs 6.88-crore synthetic athletic track for War Heroes Stadium, Sports Authority of India's Centre for boxing, kabaddi and basketball at Barnala, Rs 49-crore sewerage system for Khanauri, Lehra and Moonak under the National River Conservation Project. The MP has also been successful in upgrading all seven railway stations in his constituency to "Adarsh stations". Some other proposed or in-progress railway projects that go to his credit include the road under bridge at Lehragaga, road overbridge (ROB) at Sangrur, footbridge at Dhuri, halting of trains at Sangrur, Sunam, Dhuri, Barnala and Tapa, proposed electrification of railway line and coloured signaling on the Jakhal-Ludhiana railway route, introduction of a few trains, including the Ludhiana-Delhi Shatabadi, and extension of a couple of railway routes. Under the Member of Parliament Local Area Development Scheme (MPLADS), Singla received Rs 16.5 crore during his more than four-and-a-half-year term. The administration is yet to receive another installment of Rs 2.5 crore for 2013-14 from the Centre. The MP has already recommended 1,791 works worth Rs 17.63 crore in his constituency. However, as per guidelines and norms of the MPLAD funds, the administration has sanctioned 1,627 works to the tune of Rs 16.22 crore so far. Of Rs 16.22 crore, a sum of Rs 10 crore has already been utilised to complete 1,166 works. Thus, till now, 62 per cent of the total sanctioned funds have been utilised. However, the remaining 461 works are either under process or yet to be started. To complete those works, the executing agencies have already withdrawn Rs 4.67 crore from banks, but the administration has not received utilisation certificates from the agencies so far. The MP has also released funds for school buildings, reverse osmosis systems in schools, cremation grounds, dharamshalas, gaushalas, submersible pumps, sports gyms, water tankers, stadiums and water disposal system. Singla said he had asked 31 questions in the Lok Sabha on various issues and participated in four debates. He said he had raised questions related to drugs, police excesses and a state-specific issue (abolition of 50 per cent quota for Punjab by Thapar University, Patiala), which was later restored. The MP said he was satisfied with his performance due to the support extended to him by the people and the Congress-led UPA Government for bringing development projects to his constituency. About the forthcoming Lok Sabha elections, he said: "Let the people decide. I leave it to the voters of my constituency. However, I am confident that they will repose faith in me, considering the way I have worked for them." Rajya Sabha member and Shiromani Akali Dal candidate for the ensuing Lok Sabha elections from Sangrur Sukhdev Singh Dhindsa (who lost to Singla in 2009) said: "Singla did nothing for Sangrur during the first four years of his term. Realising his responsibility on the last lap of his term, he had kick-started a few projects, which are yet to be completed. As far as setting up of the PGI Satellite Centre at Ghabdan Kothi is concerned, except allotment of contract to construct the boundary wall on 25 acres, nothing has been done." Most of the people expressed their opinion in favour of the MP when they said he was accessible to them on phone, at his residence or in their respective areas. Barring first two years of his term, he has reportedly been visiting the constituency frequently. People are also appreciating him for the projects he has brought to the constituency. Besides, he has also not been in the eye of storm so far. Gurmeet Singh, 37, a tea stall owner, said Singla had done something which no other MP had been able to do. Jatinder Singh Tung, Additional Deputy Commissioner (Development), said the MP had released grants on the basis of the needs of the constituency. "His approach has been development-oriented and that's why he looked into consideration the entire constituency while sanctioning grants." However, the image could not be transformed into any real development as her "political struggle" with the state leadership "spoiled" her efforts to see development in her constituency. Having won the Lok Sabha elections twice in 2004 and 2009 and being a Dalit leader, Selja enjoyed a strong foothold in the constituency and even went on to become the Union Social Justice and Empowerment Minister. She remained instrumental in getting some mega development projects approved for Ambala from the Union Government during her 10-year tenure as the MP. However, the projects which became victim of her political differences with Chief Minister Bhupinder Singh Hooda include the Yamunanagar-Chandigarh Rail link, multi-crore solid waste treatment plant (SWTP) at Patvi and Rs 93-crore sewage treatment plant. On her part, she was accused of scuttling the Haryana Government's projects, including the National Martyr Memorial and the project to set up Industrial Model Township (IMT) in Ambala. Her efforts of getting the leased land in the Sadar area of Ambala Cantonment converted into free-hold plots, which is affecting thousands of families and is a major issue in Ambala, also proved futile. However, till her nomination to the Rajya Sabha recently, Kumari Selja remained unfazed by the fact that non-completion of these projects would affect her winning prospects in the Lok Sabha elections. Talking to The Tribune, Selja said people in the constituency knew exactly who brought these development projects to Ambala and who all worked to block them. Rating her chances of winning again as bright, she said: "I was all geared up to represent Ambala in the next Lok Sabha and ensure that these projects were completed. But now, I have been nominated to the Rajya Sabha and would continue to raise the voice of the common man of Ambala." Selja's utilisation of the MPLAD funds remained low. Official records show that from 2009 to November 2013, she had released Rs 6.27 crore for 210 development sanctioned projects. Out of these, 129 were completed, while work on 57 was still in progress. As many as 13 projects could not be started and 11 were not feasible. Selja's political opponent BJP's Rattan Lal Kataria, who lost to her by a margin of 2,34,935 votes in the 2009 Parliamentary elections, said she had been a complete failure in terms of development of the constituency. Talking to The Tribune, he said she represented the constituency for 10 years, but development was nowhere to be seen. BJP leader of the legislative party and local MLA Anil Vij said Selja had nothing to boast about in the name of development. He said it was hard to belief that an MP of the ruling party, who even held a ministerial portfolio at the Centre, could not get important projects completed in her constituency. He said it was the lack of political will that prevented development in Ambala and not just her difference with the state leadership. Local residents have also been of the view that development became a casualty under Selja's tenure. While the AGP is busy setting its house in order, the AIUDF is plagued by double standard of its leader Badruddin Ajmal, who placates the Congress high command in New Delhi and opposes the party in Assam. The Congress is trying to hold its fort while the BJP is eyeing for a much better performance this time. The Congress, which has been in power in the state since 2001 under the leadership of Chief Minister Tarun Gogoi, flaunts the ‘much-improved’ financial scenario and faster pace of development achieved by its government to woo voters. On the other hand, the BJP is set to plank its campaign on ‘corruption’ during the Congress regime, deteriorating law and order situation, rising crime graph and the Congress’ failure to tackle the problem of illegal migrants from Bangladesh. Given the national political scenario and the ‘Modi wave’ orchestrated by the Sangh Parivar, the 14 Lok Sabha seats in Assam will be important for Congress given that the party has been in power in the state without a break since 2001. The Congress is exuding confidence to improve its performance from the 2009 Lok Sabha elections when it won seven seats out of the total 14. Gogoi says people of Assam will vote for the party because the Congress government has been able to provide political stability, expedite the development process and contain insurgency through the two-pronged strategy of development and peace dialogue since 2001. “The people of Assam are politically mature and know how the Congress-led UPA Government at the Centre has been helping the state since 2004 in improving financial condition, creating jobs and improving infrastructure. The people of Assam don’t want the dark days in late 1990s back when the state’s finances were in strait jacket. The state had no funds to pay salary to employees. Development works came to a standstill and militants were dictating terms,” Gogoi said. Dismissing the ‘Modi wave’, Gogoi said this would peter out in the state. The BJP remembers Assam and its burning problems only when the elections are round the corner. The Congress is targeting the poor section of society and religious minorities (Muslims) to win the polls as it knows that the middle-class, especially the urban middle-class, might be influenced to some extent by the ‘Modi wave’. 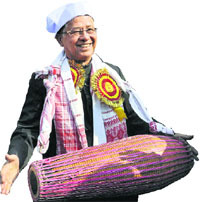 To woo the poor voters, Gogoi has gone to the extent of making an unprecedented budgetary provision for cash gift to BPL families during the next Bohag Bihu (spring festival) that will be celebrated before the Lok Sabha polls. As usual, the Congress expects to sail through because of the division of votes among the three main opposition parties, the BJP, AGP and AIUDF. The BJP hopes that the nationwide ‘Modi wave’ will sweep Assam too and the party will be able to improve its tally of four seats. The BJP, which is harping on the Gogoi Government’s failure to control prices, improve law and order situation, check corruption and burning problem of illegal migration from Bangladesh, hopes that its vote share will improve this time at the expense of the AGP, which is ridden with internal conflicts and lacks vision after repeated rejection of the people of Assam since 2001. The AGP has been witnessing exodus of party men of late who have shifted allegiance to the BJP. The AIUDF pins hopes on its base among Muslims to give Congress and the BJP to high tome during elections. It is projecting itself as the champion of religious minorities in Assam while criticising the Congress for playing vote bank politics with Muslims. In the 2009 Lok Sabha elections, the Congress won seven seats, BJP four, AGP, AIUDF and the Bodoland People’s Front (BPF) one each. The AGP got 14.6 percent votes, 16.21 per cent, AIUDF 16.1 per cent, Congress 34.89 per cent and BPF 5.41 per cent. In the 2004 Lok Sabha elections, the Congress won nine seats, AGP and BJP two seats each one seat went to an Independent. The Congress polled 35.70 per cent votes, BJP 22.94 per cent and the AGP 19.95 per cent. The NCP will most probably field Water Resources Minister Sunil Tatkare, a close aide of Ajit Pawar, from Raigad, while PWD Minister Chhagan Bhujbal will test waters from the Nashik Parliamentary seat, replacing his nephew Sameer. The NCP will give the Amravati seat to the Congress in return for Raigad. The party had proposed that as the Congress was unable to wrest the Raigad seat from Shiv Sena for the three consecutive terms, it should be given a chance, sources said. "They (UPA) are only for some more days," she said replying to the debate on the Governor's address amid boycott of the House by the Left and Congress members who were alleging that the Chief Minister avoided the House regularly. Accusing the Centre of attempting to "starve" the state, Banerjee said, "Even the funds under the MNERGA have been stopped by the Centre for the past three months. "Why did it allow the CPI(M)-led Left Front to take loans time and again during its regime?" she asked. Claiming that there was a growing political love between the CPI(M) and the Congress to split Trinamool Congress votes in the Lok Sabha elections, Banerjee said the two parties would transfer each others votes in the coming elections. Banerjee, who had called for a "parivartan" (change) in Delhi and spoken of a federal front of regional parties, said the days of the UPA Government were numbered because of its "anti-people" policies after the Trinamool Congress quit the UPA alliance. "I was recently working on a project based on the life of freedom fighter VD Savarakar and I was influenced by him. The freedom fighters have done so much for the country and even I felt like contributing to the country. It was then I decided to take a plunge into politics," said Narula, who has also sung in hit films like "Mission Kashmir", "Mohabbatein", "Phir Bhi Dil Hai Hindustani" and "Bunty Aur Babli". 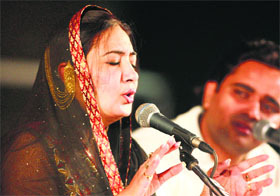 Announcing her entry into the party, Sanjay Singh, senior party leader and Political Affairs Committee (PAC) member, said the singer would help in strengthening the party base in Punjab. The party also welcomed General PC Panjikar (retd) and activist Geeta Arya from Bihar and Anil Kumar Banfore, also a social activist, from Jharkhand into the party fold. After announcing Kumar Vishwas's candidature against Congress vice-president Rahul Gandhi, there is a buzz that the AAP might pit Shazia Ilmi against Congress president Sonia Gandhi in the upcoming General Elections. However, the party did not confirm the development. "We are yet to finalise our candidates," party spokesperson Dilip Pandey said. Ilmi, a party leader and member of the National Executive Committee, had unsuccessfully contested the Assembly elections last year from the RK Puram constituency and lost by a narrow margin.